Some have told me that 'tablets are dead'. Sure, these days a lot of what's needed you can work with on your phone. But when it's really time to set to work, you'll not only need more screen for your eyes, you'll need to be able to bang away on some keys to write out longer paragraphs etc... and I don't really want to go all the way to the basement, or even sometimes use the Pixelbook. It's like there should be something in the middle. Well, the tablet fits that bill. It's a niche use, but there are enough users out there who have found it meets their needs that I don't believe those people when they say 'tablets are dead'. Whether it's hanging out in the hammock on a sunny day reading a Google Play Book, or setting up the tablet to watch Netflix while you fold laundry in the bedroom, a tablet is well suited. Last year, the Galaxy Tab S3 was that nice intro 'work tablet' device; and for those who said tablets were dead, that review was one of the highest viewed all last year. Tells me something. This year there's the Tab S4. There's a press release below if you want to check it out. So, reading through the media release it looks like some of the issues I had with the S3 seem to be fixed. Still unfortunate that the dock is sold separately (almost why bother if you're not going to get them too? ); and we still don't know a Canadian price to determine it's financial viability. But, we do know that the fingerprint sensor is gone (I always hated that Samsung button) and the software keys are gone too, so it's all screen. Really make it look like the 'monitor' it should be. From the little picture, it looks like there's a cut out for the camera. Additionally, there's DeX built in that you can put it in that 'desktop environment' at the tap of a button. Make use of that screen you have. Cool. The screen is slightly larger (16:10 ratio filling the frame), but the battery is considerably larger! Definitely a must. Looking forward to getting a chance to review this. What would you like to know about it? Whether at the office, at home, or on-the-go, the Galaxy Tab S4 keeps you going with a 7,300mAh battery that provides up to 16 hours of video playback. Additionally, with Samsung Knox, Samsung’s defense-grade mobile security platform, customers and companies can ensure critical information is protected at multiple levels of the device. IT managers can also tailor the employee interface to align with business needs. 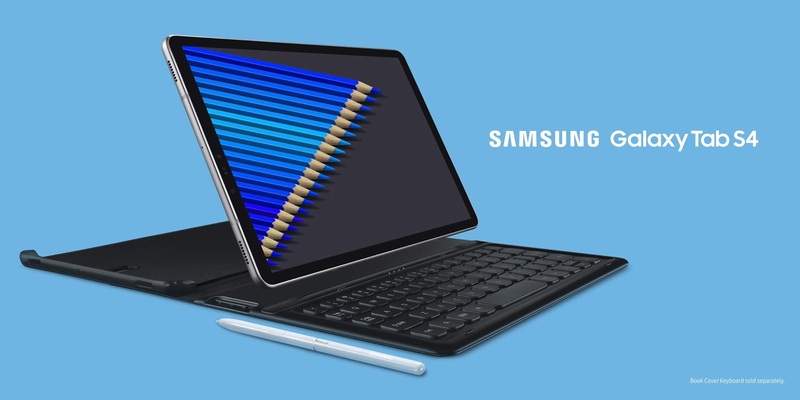 similar in size to the Galaxy Tab S3, the Galaxy Tab S4 sports narrower bezels to fit a large 10.5-inch display with Super AMOLED technology, as well as a 16:10 screen ratio with 2560x1600, 287 pixels per inch (PPI) resolution for vivid picture detail and true-to-life visuals. When it comes to audio, the Galaxy Tab S4 also comes with four speakers tuned by AKG and Dolby Atmos® immersive sound technology, which brings entertainment to life through moving audio that flows all around you. With Dolby Atmos®, the Galaxy Tab S4 supports crisper dialogue, enveloping sound fields, maximized loudness without distortion, and consistent playback volume.